I don't know what it is about Russell Brand but I am drawn to his videos and when I saw this book I grabbed it. Most people have something that they you can consider an addiction, do you shop when you are depressed, can you put your phone down, are you addicted to video games, what about drama? 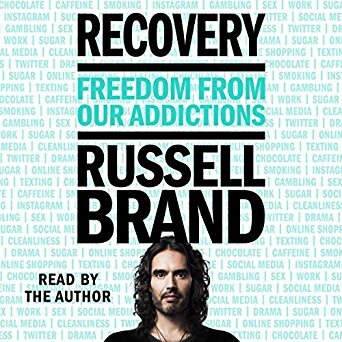 While Brand uses the 12 steps of most addiction program he has changed the wording to make them more accessible to those who aren't religious or can't connect with the religious undertone of most of these programs. While Brand has found yoga and a spiritual connection in that way it just doesn't feel the same. He strongly emphasizes connection, and without connection we are left to our own fucked up devices. Research actually agrees with this and has found that connection is a key player in addicts getting clean and staying clean. It is when we lose connection that our brains start drifting toward behaviors that aren't very helpful. While I am not addicted to drugs or alcohol it is rampant in my family...which makes me wonder am I addicted to the drama of addicts? There is also that pesky shopping habit...when I feel out of control or down there is always amazon. If nothing else this book is a good way to look at your life and your habits and see if there is anything holding you back from being your full self.